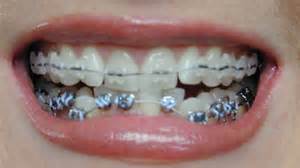 Homeopathic remedies will heal pain from braces, a palate expander, installation and periodic orthodontist adjustments. Aconite for fear of the treatment, anxiety, fright. Fear is exhibited by sudden panic, dry mouth; the fidgety type of person. Arnica for bruising, general soreness and pain in the mouth. . There is mental trauma following a long and stressful dental appointment. The soreness resulting from spreading of the teeth usually responds this remedy - if not then Ruta will help. Belladonna where there is intense throbbing pain which comes on rather rapidly and is aggravated by any kind of pressure or movement. Calendula if cuts or scrapes from braces touching the sensitive areas of the mouth. Also rinse with a calendula tincture daily. Chamomilla very useful in tincture form for acute toothache of pulpal (nerve) origin. Neuralgic toothaches when the person is in such pain they can't take it anymore. People who need this remedy tend to be particularly sensitive to warm food and drink (especially coffee) and their symptoms are worse at night. Gelsemium for anxiety before the appointments, nervous worry, butterflies in the stomach. Feels nauseous or have a nervous diarrhea. Person feels drowsy, weak-kneed and trembling. Hypericum for shooting/nerve pain and great sensitivities in the mouth on placement, with expanders or adjustments. For trauma to nerves, nerve injury, called the "Arnica of the nerves". Magnesium phos for relief from heat, pain shoots like lightening. For muscle pains and muscle spasms. Better from warmth, worse from cold, and better from pressure. This type of muscle spasm may result from an injury (such as an injection), or from having a person hold their mouth open during a prolonged dental visit. Ruta to ease the discomfort associated with fitting and adjusting braces. Called the "Arnica of the bones." When orthodontic patients get their braces tightened or their spacers put in this is a great remedy to use. The soreness resulting from spreading of the teeth usually responds to Arnica, but if it does not work, then Ruta will. Staphysagria pain from the procedure, feeling pushed and poked in the mouth, emotionally invaded by the procedure.